When TDmonthly Magazine interviewed retailers in February of 2013, we learned that the Pound and Tap Bench from Hape is still flying off of specialty store shelves. 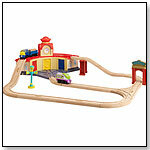 Other favorite wooden toys included simple classics, like puzzles and trains. See all of the Top-10 Wooden Toys below. Pounding sends the balls tinkling over the xylophone. Pull out the keyboard and the xylophone can be played solo. All Hape products comply with EN71 and ASTM quality standards - wood used comes from FSC managed forests. Awards: May 2012 TDmonthly Top Toy Award. Why it won: This item was named a Top-10 Musical toy in February and a Top-10 Wooden toy in March by specialty retailers interviewed by TDmonthly. 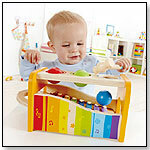 Its innovative design combines the elements of the popular shape sorting/tapping toy and the xylophone, giving it great play value. — As of 1/6/2012 this product had 4.2 out of 5 stars from 13 reviews on Amazon.com. Pros: Durable; lots of ways to play. Cons: The keyboard is not properly tuned. — In a 2012 survey about Musical Products, three out of 13 retailers said this item was their best seller. Kelly Boone, manager of The Elephant's Trunk in Greenville, S.C., told TDmonthly that they sold at least 36 during the holidays. 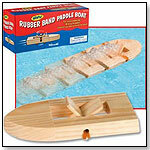 Wind up this 6 inch wooden boat and watch it paddle across the water. Each boat includes three rubber bands. Powered by an ordinary rubber band, this old-fashioned paddle boat zips across bathtub, swimming pool or pond-inspiring pure delight. A simple, time-tested classic, it's crafted of varnished pine with rubber band-driven paddle wheel. Simply wind paddle, place boat in the water, carefully release, and watch it go. 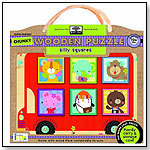 Brand new Earth-friendly green start chunky wooden puzzles are made with wood from sustainable forests and packaged in a reusable carry-along storage case. Created with the help of child-development experts, these puzzles have chunky, raised pieces to support basic grasping skills, combined with slight gradations of cognitive challenge. A fun double-decker bus contains six square windows of the same size and shape that can fit into any of the spots but need to be rotated so the animals face right side up. Border of each piece matches color inside well. Launch date: April 2012. HABAland Train Building Blocks by HABA USA/HABERMAASS CORP.
With a future-retro design, and connectable, interchangeable parts, this sleek toy vehicle can fit in the palm of a hand. Automoblox Minis received a TDmonthly Top Toy Award 2007. — Automoblox has been a best-selling line, according to retailers surveyed by TDmonthly, since 2007. — "That little three-piece Automoblox set sold extremely well. I've sold about 40 of them in two months," Janet Gregory, owner of Over the Rainbow in Anchorage, Alaska, told TDmonthly leading up to Christmas 2009. Two of 44 specialty retailers named Automoblox as an overall best seller in late 2009. — In a February 2012 survey about wooden toys, two out of 14 retailers said that Automoblox were their bestseller in the category. Pam Byrd, manager and buyer at The Little Cottage Toy Shop in Franklin, Tenn., told TDmonthly that "Automoblox is still strong." This fishbowl features three happy residents for puzzle play. The extra-thick, three-piece wooden puzzle includes a fish, a turtle and a crab, each with jumbo wooden knobs for easy grasping. Full-color, matching pictures appear underneath each piece. — In a Summer 2011 survey, 5 out of 12 retailers told TDmonthly that wooden peg puzzles from Melissa & Doug were their best-sellers in the category. — As of 7/12/2011 this product had 4.5 out of 5 stars from 32 reviews on Amazon.com. Pros: Durable; age-appropriate; puzzle pieces fit well. Cons: One reviewer said the veneer on the puzzle pieces began peeling a month after purchasing it. 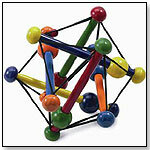 Skwish appeals to baby's visual and tactile curiosity, making this sophisticated toy a source of wonder and learning. ”It never loses its shape, allowing it grow with baby,” Associate Marketing Manager Amy Cathey of Manhattan Toy told TDmonthly. “Adults also love it as a stress reliever, so it appeals to anyone.” Launch date: 1988. ― Of 39 retailers asked to name their top-selling infant and toddler toy in March 2010, seven told TDmonthly that Manhattan is their best line. Three named Skwish, reporting sales averaging 24 per month. ― “Manhattan Toy is my biggest vendor, both for infants and toddlers,” said Barbara Paeth-Haas, owner of The Durango Kid in Durango, Colo., in spring 2010. 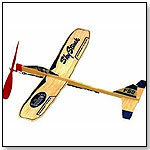 — In a February 2013 survey, Cariad Owen, manager of Out of the Blue Toys in Albuquerque, N.M., told TDmonthly that Skwish was their best selling wooden toy.